Facing Deportivo La Coruña in his first match, Zidane has not had enough time to put his stamp on Madrid’s performance in all phases of the game. Even though they won decisively, it will obviously take a while to clean up the mess that led to a record of 11-4-3 in La Liga. The spectators at the Estadio Santiago Bernabéu saw approaches that made Ancelotti’s Real Madrid side famous as well as the tactical difficulties Benítez did not overcome during his short spell at the club. At his first press conference, Zidane rudimentarily explained his preferred elements. Focusing on an attractive attacking style, he said “possession” and “speed” are the firm ground he intends to build a team on. Let us look at the encounter with La Coruña. Did Real Madrid see more of the ball? Check. Did they play at high speed? Check. Has Zidane already solved all problems? Of course not. Unsurprisingly, he placed his trust in a familiar line-up, fielding Isco while leaving James Rodríguez out of the starting eleven. On paper, it was a customary 4-3-3 system that quite often turned into 4-2-4-like formation over the course of 90 minutes. BBC – the Bale-Benzema-Cristiano connection – were at liberty to roam around fluidly, switching positions all the time. Isco, meanwhile, should be considered the freethinker in midfield, but became dull in reality. The 23-year-old frequently left his number eight position, moving to the left side, although Real Madrid already struggled to bypass Depor’s middle block. Bad positioning overall. Three attacking players were not in play. Fluidity upfront sometimes caused a lack of presence in the central zones near the offside line. 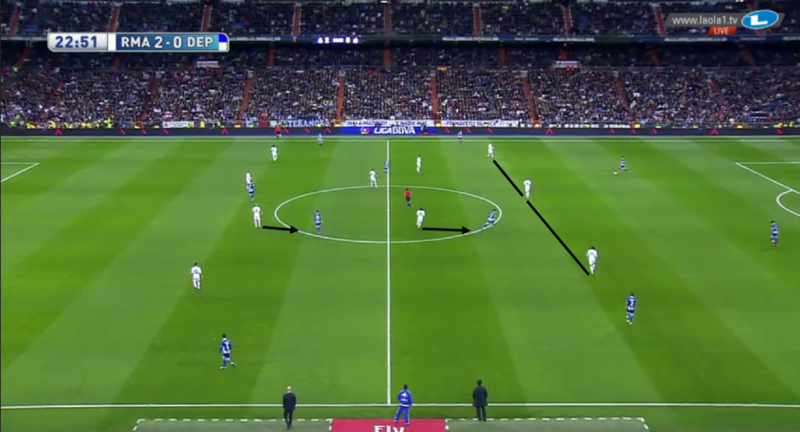 As a result, Madrid’s formation was pulled apart vertically, with a lack of ideas on how to set up combination plays. 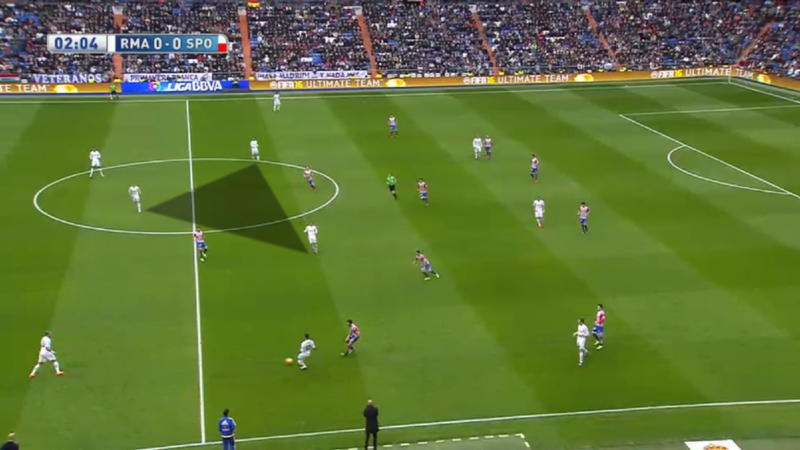 Two or three central midfielders stood a few yards apart from each other, not even trying to play short one-twos to penetrate the zone between Depor’s lines. Rather, one playmaker of the midfield triangle – mostly Toni Kroos – usually picked up the ball and knocked it towards the sideline. It was Madrid’s strategy to avoid the opposing block. Spreading out the wingers, Gareth Bale and Dani Carvajal in particular received many cross-field passes. The latter walked through the half-space, leaving room for Bale on the outside lane, or he bombed down the flank, so that Bale had the option to run a diagonal route into the penalty box. Overloading at least one side consistently, Real Madrid were able to break through Depor’s defence from the outside on many occasions and scoring more than once assisted by a crossed pass. Again, the midfield triangle had the ball. Carvajal waited in the half-space, next to Bale. So far, so good. However, unlike the Castilla side Zidane coached before taking over the first team, the narrow midfield, not intending to set up combination plays and not showing lateral movement, seemed to be ineffective. Real Madrid relied on Kroos’ and Modrić’s accurate balls to initialise breakthroughs. 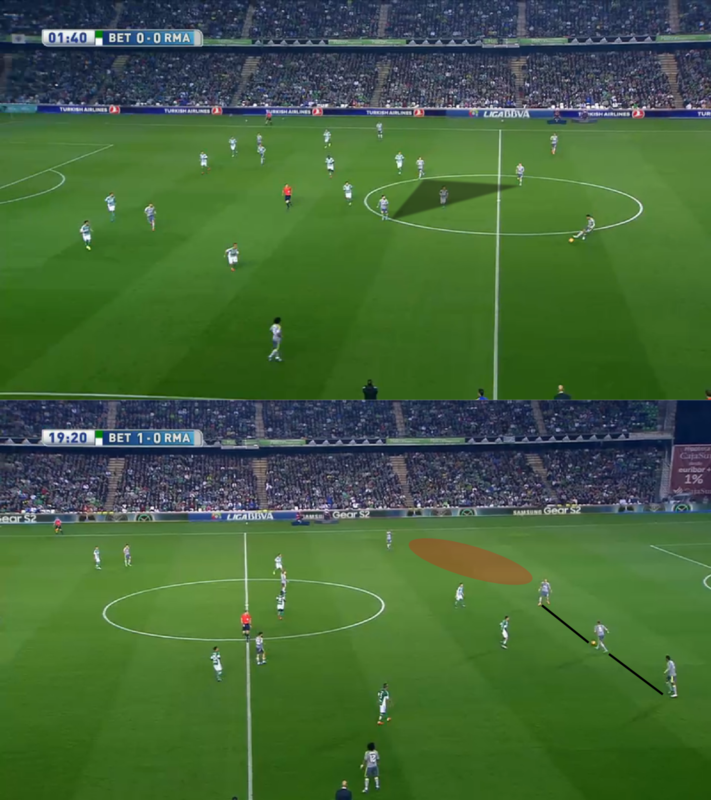 Yet, that particular strategy can only work against a team like Depor that clearly had a speed disadvantage. Defensively, Madrid reminded us of some dark moments in recent months. 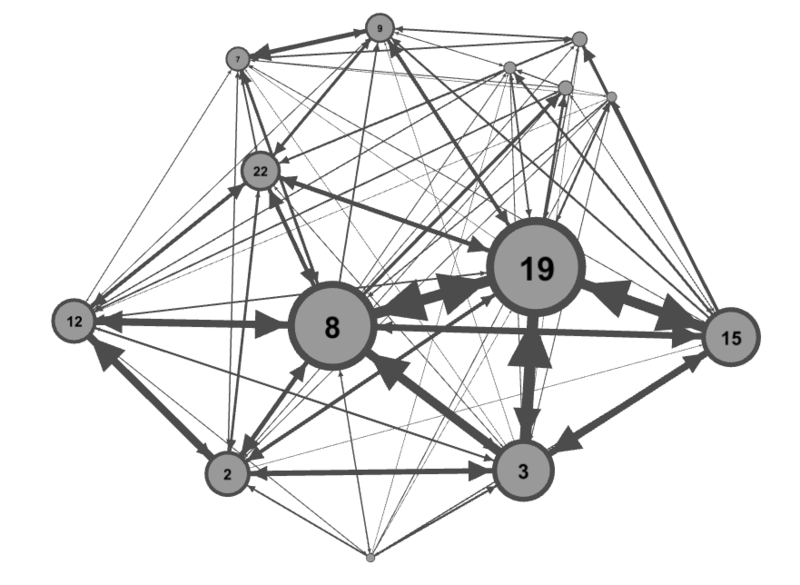 A back-pedalling back line paired with coordination problems in midfield, when pressing, caused big holes between the lines. Kroos in particular left the back-field in that situation. The two parts of Madrid’s formation gaped open extremely. 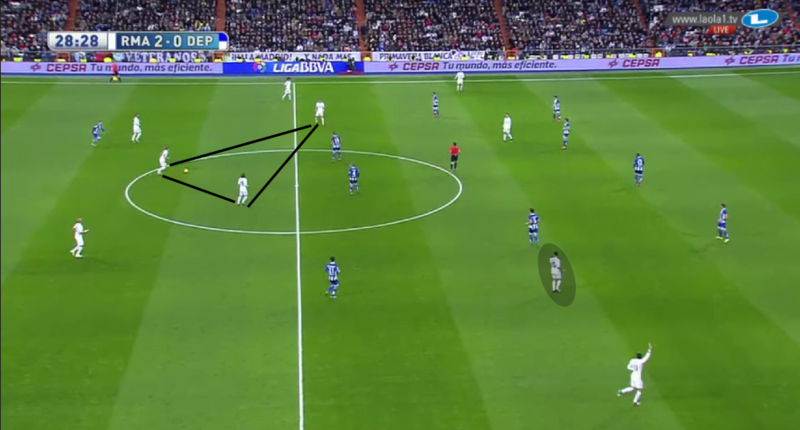 Real Madrid mostly defended in a 4-3-3/4-1-4-1 shape, with situational man-marking duties. As Ronaldo and Bale did not consider themselves too good for chasing back and helping the full-backs, and as all central midfielders attacked Depor’s build-up plays aggressively, intensity was not a problem. Instead, the question is how to use intense pressing in all thirds of the pitch. Zidane has to work on chain mechanisms, proper position and zone awareness, and the motions far away from the ball. On balance, a 5-0 win over Depor is a badly needed breather for Real Madrid, but not more than that. Zidane led Real Madrid into the second match, which showed crucial improvements in comparison to the weeks before. Los Blancos were annihilating a poor Real Sporting de Gijón side for the majority of the first half. After 18 minutes of madness, Real Madrid had already scored four goals. The match ended in a 5-1 victory. Zidane, again, preferred Isco over James Rodríguez in midfield. This time, the Spaniard really served as a third central midfielder, mostly roaming through the left half-space and picking up balls deep in Madrid’s territory. As a consequence, Marcelo had to interpret his role differently than in the first match under Zidane’s guidance, constantly reacting to Isco’s motions. At first, the Brazilian left-back often ran upfield in the early phase of Madrid’s build-play, waiting near the offside line. Later, he became increasingly involved in the initial build-up plays, as Real Madrid usually used a back three, when in possession, with Pepe moving towards the right half-space. Although their positional play is far from perfect, Zidane has certainly improved certain facets of their game in the last two weeks. In particular, Madrid’s attacking players ceaselessly switched positions, generating dynamics within the formation that are hard to cope with. For instance, when Ronaldo dropped back, waiting in the space between Gijón’s lines, Isco advanced towards the offside line, with a speed advantage over the stationary defenders. Benzema in particular was very mobile, leaving his position repeatedly to roam through the half-spaces. Yet, the French forward did not have to bother about Real Madrid’s presence upfront, as either Ronaldo or Bale ran routes to the inside. Only a few times, the central zones upfront were vacant. But even when Real Madrid made mistakes in terms of positioning, they rectified those errors immediately. Showing positional awareness and using angular passing patterns intelligently, Zidane’s players are slowly rediscovering old virtues, reminding us of the great tactical displays they once had under Ancelotti. Before the depature of Benítez from the Bernabéu, Madrid leapt into a point where many of the strategies they had developed under Ancelotti did not work anymore. On many occasions, they started an attacking play slowly, but once Kroos or Modrić played a longer cross-field pass to one side, the team accelerated all of a sudden, making sprints into the channels, while running Gijón’s poor defenders down mercilessly. Emphasising elements still in need of improvement, the passing triangles, when building up, sometimes have no effectiveness whatsoever, as Kroos and his team-mates are too close to each other, while positioned in front of the opposing block. Rather, some midfielders or a (false) full-back should penetrate the zone behind the opponent’s first pressing line. Zidane cannot completely turn things around within a few days. Although steamrolling a team like Gijón means little, the team’s sense of rhythm changes, and their precision and smoothness when moving the ball was conspicuous. Possession went hand in hand with speed. “I believe we are on right path,” said Zidane after a 1-1 draw at Real Betis. Even though Real Madrid dropped their first points under him, the Frenchman could clearly be happy about his team’s adjustments during the match against an aggressive opponent. However, concerns about the effectiveness of their formation in the early stage of their build-up play remain. In many situations, Kroos stood right in front of Varane and Pepe, smothering the two centre-backs – on one occasion the German even blocked Varane from running forward through the half-space. And as Modrić also joined the party, Real Madrid certainly overloaded the wrong space. Rather, they should have had both centre-backs in wider positions, when Kroos dropped back, plus Modrić in a more aggressive role upfield. All three centre-midfielders were positioned too deep in the first half. And when Kroos was dropping between the centre-backs, Varane and Pepe were too close to Madrid’s playmaker. Not penetrating the space behind Real Betis’ first pressing line, Madrid’s build-up play looked slow and predictable. It is questionable if this is Zidane’s idea of effective possession football. Surely, the short distances between all players involved in the build-up cause precision and a steady ball circulation. Yet, it limited their ability to accelerate while moving the ball forward. On a positive note, Real Madrid displayed interesting ball-orientated shifts in defence. 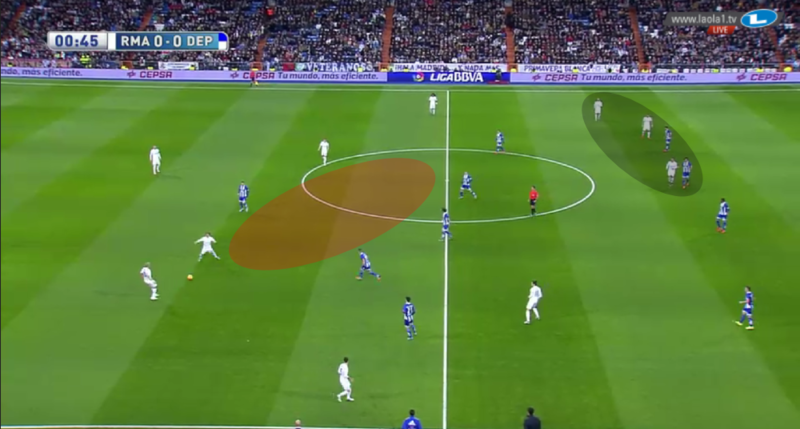 Although the zones behind Rodríguez and next to Modrić were vulnerable, which partly caused the goal they conceded in the first half, Madrid were able to move their formation clockwise or anti-clockwise, so that they positioned a diagonal line in front of the ball carrier. A diagonal pressing line limited the ball carrier’s options near the sideline. Madrid needed about sixty minutes to fully adjust their positional structure in offense. After the interval, Modrić was usually positioned higher than Kroos – in some sort of number eight role. And a couple of minutes after the restart, both full-backs conspicuously took more risks, rushing forward far more often. Kroos still picked up the ball too deep many times. Having said that, when he entered the last third he turned into a dangerous strategist. Kroos initialised the equalising goal by playing an accurate through ball to Rodríguez, who, for once, chose the right spot near the offside line. In the last minutes of the game, Madrid pushed Real Betis against the wall, but could not capitalise on their dominance. Zidane saw his team being almost neutralised by an aggressively defending Real Betis side that pressed with intensity in the first half. And he, moreover, had the chance to observe that losing their build-up shape and therefore giving the centre-backs and centre-midfielders breathing space could be a factor to make their offense more unpredictable.